The Porsche 911 Supersport was originally only available as a factory option ‘M491 Turbo-Look’. From 1986 the car was made available as an official model. These later official versions had the Turbo body and rear tea tray spoiler as well as turbo brakes, suspension and G50 gearbox. Wider wheels and tyres also complimented the package. Power is from a 6 cylinder 3.2 litre giving the car 0-60 in 6.1 seconds and a top speed of 152 mph. This Porsche 911 Supersport was supplied by Lancaster Norwich in December 1988, and was maintained by AFN, Lancaster Porsche, Hamilton & Palmer, Carr’s of Exeter and more recently HP Motorsports who also replaced the clutch 1300 miles ago. Its specification retains the original Blaupunkt Stereo Cassette, Top Tint Windscreen, Power Hood and Velour trimmed luggage compartment complete with original C16 sticker on the underside of the hood. Having averaged only 3200 miles per year from new this is an excellent usable classic and certainly one of the rarer models of the iconic 80’s Porsche 911. 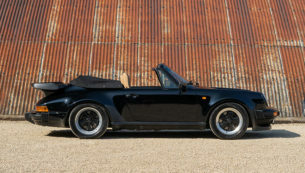 This Porsche 911 Supersport Cabriolet is now available for sale and immediate inspection at The Classic Motor Hub. WANT A QUOTE TOINSURE THIS VEHICLE?